“You will not want to sleep through this,” said Muninn. They were sitting on a boulder, with August’s blanket under them to soften the stone and although the rock was on sloping ground the small rise behind gave no shade and the heat beat down upon them. “Stop complaining,” said Muninn. “Do you see him complain?” And she indicated the man below, bent and hunched over the ground, sifting and sorting and brushing, his dark face a study in concentration and his fingers gentle in the earth. Huginn had wedged himself beside the man, right up close to his knees, and August couldn’t understand how he wasn’t knocked aside as the man worked, but the raven bobbed and weaved his way around obstruction. “What’s he looking for?” said August. There was a brief moment of stillness then as Kamoya paused, his body silent, unmoving. And then he was moving, and Huginn too, as Kamoya dug a dark fragment out of the earth and Huginn’s beak was pressed up against his hands, pecking at the dirt between fingers, and then there was a little curved piece of bone, no bigger than August’s palm, and Kamoya held it up to the light and grinned while Huginn cawed in triumph. “What is it?” said August again, leaning so far over his boulder that Muninn was obliged to take a fold of his pyjamas in her big blunt beak and haul him back from overbalancing. “Is that his name, Ergaster?” said August. “I like Ergaster better,” said August. It reminded him of his own name. They seemed to fit together, belonging as they did to two boys who would die young and in such different places. Ergaster would not have spent his life in bed, or being taken to hospitals for beads and blood tests. He would have found August’s life amazing, a strange story and a frightening one, perhaps, and he could have shown August his own strange life so that August could be amazed and frightened in turn. Two boys. He was sure that they could have found something in common. “How long ago did he live?” said August. “One and a half million years since,” said Muninn, placid, and her wings flexed as if remembering long soaring and flights far beyond. Huginn gave a satisfied croak then, and just a moment before Kamoya rose the raven clambered onto his shoulder and was carried all unnoticed back to camp, his head held at a jaunty angle that mirrored Kamoya’s happy expression. The man looked, August thought, as Caroline had looked when she lifted her face from the telescope: a look of wonder and discovery that connected through centuries and continents. “I wish I could stay and see all of it,” said August, knowing that he could not. He had both a day for himself and little more than a week, and neither would be enough. That August understood. His life was shorter than most, and everyone he knew would move beyond him, on and on, but they would move beyond for decades, perhaps, and then all of them–everyone who knew him–would be dead. But compared to one and a half million years those decades were short, and the confusion made him feel very small. It was as if the decades he would miss did not actually matter. It was as if they were almost nothing. There was a pause. “I’m not going to be a fossil, am I?” said August, with some trepidation. He didn’t know whether to be anxious or sorry. He found he did not quite like the thought of being poked at and dug up and arranged after death. His body had been displayed and prodded enough beforehand–and yet, and yet. It would make a change to have people excited about him being dead, instead of just plain sad. “I don’t know,” said August. “I wouldn’t have minded being a fossil hunter, though,” said August, and beside him Muninn closed her eyes to the sun, as if she were dreaming and the dreams were pleasant. Tune in tomorrow for the next chapter, wherein August is taken back in time to see the first picture taken of the Earth! The ravens had brought him to a tower, high above the city, and August was just tall enough to look down out of the windows, to see the dome of the Basilica beneath him, the Square of St. Mark, and the lagoon with all the little islands. “Are we here to ride them?” said August, and Muninn shook her feathered head. “I could see them better close up,” said August. “We are very high, here.” But the bell tower was solid around him, and he was not afraid of falling. “Are they going to see a comet too?” said August. And August turned to see a procession of men come up the stairs, led by the Doge of Venice and by Galileo. And Galileo drew the men towards the open windows, where they could look down over the city as August had looked down, and it was there that he set up his telescope. “It’s a lot smaller than Caroline’s,” said August. Galileo’s telescope was made of tin, and the outside of it was decorated with red satin. Huginn had come awake again and hopped towards the group, rubbing his big blunt head up against the shiny material as if he were a cat, almost. Then he flew onto Galileo’s shoulder and perched there, nipping gently at his ear. August watched as Galileo displayed the telescope to the Doge and his companions, watched as they each put their eye to one end of the scope and marvelled. They saw ships out off the Venetian coast before their eyes could see them unaided. They saw people coming in and out of a church on a nearby island, and passengers getting out of gondolas along the Grand Canal. August saw them too, when he was able to sneak between the bodies and put his own eye to the glass, to see the tiny oars and the little prows. Huginn flapped his wings at him when he lingered, and made as if to run down Galileo’s arm and give August his own peck about the ear, if a peck that was less gentle and more censorious. “They seem happy with it,” said August, retreating to a safe distance and back beside Muninn, watching the telescope again ringed round with Venetians. “He did though, didn’t he,” said August. “I know you’ve looked through your neighbour’s window,” said Muninn, and August blushed. “She wouldn’t like you looking at things you’re not supposed to,” said Muninn. “It’s not the same thing,” said August. “I don’t understand,” said August. “And you’re saying that’s not enough,” said August. It was not a question. Tune in tomorrow for the next chapter, wherein August is taken back in time to see the discovery of Turkana Boy! The ravens had brought him to a space centre, and August sat, huddled in his blanket, one small boy in a crowd of excited people who didn’t see him, who were all looking away and outward. Muninn sat with him. “Even me,” said August, who had seen the photos, who had been born after their transmission and who would see no more. He wanted to be excited even so, but he was nearly always cold now, even on summer days, and his seat was hard. It made his bones ache. “You have seen many things that others have not seen,” Muninn acknowledged. “So don’t be greedy, is that what you’re saying?” said August, with a thin little smile, and Muninn settled her feathers primly and said nothing. The people around them had brought popcorn, some of them, and sandwiches and apple juice. One family was eating hot dogs, and August eyed them as if with the memory of hunger. He had liked hot dogs, once. And candy apples, and popcorn. Popcorn with lots of butter and salt, and plain popcorn for making strings at Christmas. Mostly he liked to hear the sound of it bursting in the pan, and the warm scent of caramelised sugar that April would sometimes mix into hers. It had smelled wonderful then, and it smelled wonderful now, but the smell was all he could appreciate. Eating seemed too much trouble, somehow, and he was never hungry anymore, but he could sit and breathe in the wonderful smells and the excitement that was beginning to be infectious, and he could watch the rocket being made ready before him, about to go up into space and beyond what anyone knew. “It’s the sparrow again,” he said suddenly, thinking of Caroline in her garden, thinking of the telescope and of Huginn croaking out the name of a man dead for a thousand years and more. Thinking of the story that Muninn had told him, of the sparrow flying through a bright hall and back out into darkness. “Except this time the hall is all dark,” he said. “That’s why the record’s with it,” said August, remembering the gold plated disc sent out with the probe, sent out to find other life and to tell about Earth’s own. August frowned. There had been experimental treatments, clinical trials. His DNA had been sequenced. None of it had cured him. None of it had made him better. “I don’t want to think about it,” he said. This was supposed to be a happy time, he didn’t say, wanting more than anything to let himself forget for a moment, to be caught up in the excitement of the people around him, to share this moment in their lives. “And that’s enough for them?” said August. Muninn flicked her wings, tossed her head at the launch pad. “Does that look like not-enough to you?” she said. “No,” said August, smiling, and for a moment he imagined himself as one of the scientists, imagined himself with them, and hopeful. It made him feel warm inside. An explosion of burning cloud engulfed the launch vehicle, until only its nose was visible, and then the great machine began to move. Slowly at first, and then faster and faster it lifted off the Earth and streaked into the sky, streaked out into the solar system and possibility. Huginn flew with it, a dark, distant shape obscured at first by the billows on the launch pad. But as the rocket rose through the air, August could make out Huginn racing up beside it, the sun glinting off his iron wings–and then he was too high to see, and gone. “How far up will he go?” said August, but he had to repeat himself because the crowd around him was cheering then in celebration–calling and applauding and so loud he nearly had to put his thin little hands over his ears. He wanted to jump up himself, to whoop and cheer with them, but it was hard to move quickly now, and it took too much breath to shout. “You’ve got things to do, still,” said August, and it wasn’t a question. “I am still making my own Record,” said Muninn. Tune in tomorrow for the next chapter, wherein August is taken back in time to see Galileo show off his telescope to the leaders of Venice! August was propped up in bed, playing Go Fish with his Dad when the ravens came. He froze for a moment, unable to make the bridge between them, to contain them both in the colliding hemispheres of his life, but when it became clear that their appearance was confined only to him he relaxed and let them watch. August would have liked to have left it at that. It gave him a warm feeling inside and he didn’t feel that often. Oh, his parents told him they were proud of him a lot, but August knew, deep down, that he had never done much to be proud of. Mostly when people told him they were proud of him it was after something nasty had happened–another needle, another operation, another painful, boring, or embarrassing test, and they were so proud of how well he’d put up with it. The thing was, they told him that even if he didn’t put up with it well at all–he remembered when he was younger, crying and screaming at the needles while his Mum hugged him, and when it was over they’d still said they were proud at how well he’d done, how brave he’d been. So when Dad told him that he was proud of him for something else entirely, August would have liked to have taken the credit and warm feelings and hugged them all to himself, but the ravens were perched on the end of his bed, Muninn with her honesty and Huginn with his determination to think the worst of August always, the irritation and the badly veiled contempt, and he couldn’t stay silent while they were watching. “I would have said something, had it gone on much longer.” His Dad put down his cards, rubbed one hand through messy hair. He opened his mouth and shut it again, and sighed. Dad smiled at him then, the kind of smile Mum had when she was trying not to cry. August hated that smile, but he knew he would have hated the crying more. At the end of the bed, Huginn shifted from one foot to the other and shook out his wings. “How?” said August. He was genuinely curious. It wasn’t like grounding him would have made a difference, or taking away his toys. He was already losing far more than telescopes and fish bowls, and against that their loss would have been a bare thing, and trivial. “Even if it made me sad?” said August, testing, though he did not know for what. “Anyone would have done it,” said August, muttering it under his breath almost and too embarrassed, too pleased, to do more than glance up at his father, at the ravens. Muninn was watching him, and her eyes were kind. After he was kissed goodnight, the ravens flew August into darkness, into a day dimmed by another eclipse and then lit up again as the Earth and the moon and the sun moved beyond each other’s lines. Yet for the first time they did not land, and August experienced the eclipse from Muninn’s back, high above the surface of the Earth. He was not afraid of falling, even though the air was damp and cold and the iron feathers wet under his fingers. Muninn never let him fall, and the air was crisp and thin and made him dizzy, a little, and that led to giddiness and to lack of worry. “There is no need to land today,” said Muninn. “I have brought you up for observation, and you are not the only observer.” She wheeled around, August clutching at her back and his legs hanging down, and before them was a balloon without a ceiling above it. In the balloon was a man with a worried expression on his face, who did not see them in the air before him, who did not see Huginn perched on the side of the basket. “It doesn’t seem like a very nice day for ballooning,” said August, and his teeth chattered with little clinks like ice. “Then why’s he so upset?” The man was talking to himself in a language that August couldn’t understand, but he had the same expression on his face that Mum did when she was trying to hang curtains and August was fairly sure that he was swearing. “What’s he doing up here if he doesn’t know how to get down?” said August, horrified. August couldn’t help it: he burst into giggles. It just seemed so ridiculous, and the more he considered his position the more ridiculous it was. High and invisible on an iron bird, his hair wet with drizzle and his fingers cramping with cold and the light new come back from darkness and then haze–and before him, a bearded man in riding boots, balanced on the slippery edge of a balloon cabin and tugging ropes at random. “I’m so glad you find it entertaining,” said Muninn. “Don’t you?” said August, still giggling and dizzy at heights. “Mine are,” said August, and he felt the iron body beneath him inflate briefly, as if the raven were silently huffing at him, and then his experiences became her own as memory went from one into the other, from source to certainty and recording. “Maybe it’s time to start doing it again,” said August. “I have been trying,” said Muninn. Tune in tomorrow for the next chapter, wherein August is taken back in time to see the launch of Voyager 2! August had to shift to see it, for Huginn was blocking his view, dancing about the instrument and forcing his face up close to it, staring into one end as if gazing at a mirror. “What is it?” he said. “Helium? Isn’t that the gas they put in balloons?” He had balloons at his birthday parties, and some of them were filled with gas that made them float high and gave his Dad a squeaky voice. He liked balloons. “I know you do,” said Muninn, and her voice was smug, as if there were secrets in it, and promises. “And yes, it is.” And that was all she had time to say, for the sky began to darken then and she hovered by his shoulder, her iron wings open in case he did something foolish and she had to cover his eyes. Instead, August focused on the spectroscope and on the ground, on the little blades of grass before him. He focused on the little plants as if he were Charles, and the sky became darker and darker until he couldn’t see them at all, until the birds that were not ravens stopped singing and the only thing he could hear was his own breathing, and Pierre’s. “You’ll have to be quick,” Muninn warned him, and when Pierre moved a little away from the spectroscope, from the telescope it was attached to (he bent down suddenly, cursing, as if something iron, something he couldn’t see, had pecked hard at his ankle) August pressed his eye to the scope. “Do you see the yellow line?” she said, as Huginn flapped up from the ground and shoved at August until he could stare into the scope with his own iron eyes. “Like you,” said the raven, and August laughed in disbelief. “But you are also a kind of spectroscope,” said Muninn–as if his fingers were glass, as if his palms were made of prisms. “For the sun?” said August. “I don’t think so.” The sun did leaves lines on his flesh–shadows, and burns that turned his skin pink and left the marks of tanning on him–but there was nothing fundamental about those lines, no indication writ upon his flesh of helium, or of hydrogen or any of the heavier elements. “It is not the sun shining through you,” Muninn replied. “It is death.” And August was quiet, because that he understood. The lines left by death were familiar to him, the lines on his body where bone showed under skin; the perfect half-circles under his eyes, delimiting in dark smudges the planes of his face. The tendons on the back of his hands, the way that all those lines together made new lines on the things that touched him. The medicine so carefully measured, sometimes in little cups and sometimes in bags of fluid to be hooked up to his body and pumped through, the needles sharp and straight against his skin. The pulses on the machines about his bed, the way that they measured differently the different parts of him. They had been talking through darkness and a strange sort of twilight. Then suddenly there was colour in the world again, only greys and blues at first and then more and more as the light came back and the eeriness passed and August could look up and Muninn’s wings were folded. “I don’t look in mirrors anymore,” said August. He knew what he looked like, knew what sickness had done to him. And even if there hadn’t been mirrors, like the one that had hung above the fish tank until he had asked for its removal, he would have known because other people had prisms too. He could see in their faces what he looked like. He could see that they knew what was coming. He didn’t need a mirror when he had other people. “And they don’t need one either, not when they have you,” said Muninn. “They have them anyway,” said August. He was the only person he knew who did without mirrors. April had one in her room. So did his parents. And there was a doctor, one of his favourites, who had long black hair all twisted up in a complicated style that she couldn’t have achieved without a looking glass. Another whose eye-liner was never smudged, another with a moustache he trimmed into strange shapes sometimes to make the kids on the children’s ward laugh. He wondered if there were another reason–if they finished up their days and went to look at themselves when they were done, went to check their own prismatic faces to see something shining through that wasn’t death, not yet, for all it left lines on them. Tune in tomorrow for the next chapter, wherein August is taken back in time to see Mendeleev make a hash out of ballooning! Muninn flew him to the very top of the mountain. August could not have walked up on his own, nor could he have sat a horse, or even a donkey, for the length of time it would have taken for them to carry him upwards. Nor, when he was at the top, could August go exploring. The top of the mountain was a shattered jumble of rock, of weathered and fractured greenstone, all split and shattered and the fragments unsteady beneath him at angles. “You will turn an ankle if you’re not careful,” said Muninn, and she was not wrong so August picked his way to the nearest slab. He was dizzy often now, dizzy from more than heights, so he was over-careful, inching his way between the rocks until he found a brief flat place where he could sit without too much discomfort. “There is more to look at than your feet, August,” said Muninn, reproving, and when the black spots disappeared from his eyes and he could make his skinny, sweating little fingers loosen their grip upon the rocks, August raised his head and looked. Before him was a nation of knives–a horizon of peaks and edges, of mountains before him as far as he could see, and some were tipped with snow. The air was cold and very still. “They are the Andes,” said Muninn, and August, who had only seen the Southern Alps when he had flown over them on another trip to Starship Hospital in Auckland, who had only seen the Southern Alps but who had pictures on his wall of Everest and Hillary, of the Himalayas and Mount Kilimanjaro and the Andes, actually squeaked in excitement. That small noise echoed and came back to him in waves, and he would have been embarrassed had Huginn not cawed then as loudly as he could, to hear his own echoes come back to him. And then Muninn was crowing too, and in the cascading effect of all their voices together August almost missed the echoes of a fourth as it came up onto the summit of the mountain with its companions, and if the man who arrived could not hear their echoes he could hear his own, and be as delighted by them. His face was so rosy with excitement, with happiness, that he seemed younger than he was, and for a moment he looked a little as August looked, and their twin small-boy faces were radiant in the sun. August felt the kinship between them, and it was a feeling that saddened but did not fade when the man did what August could not–scrambled over rocks and broken boulders, strong and healthy and able to move on his own and without help. And his steps that started in excitement became measured, and that was another point of difference between them, for if August was dying he was still young and often measurement was beyond him, and consideration, and comparison. He could grasp them sometimes, but dimly, as though they were a theory new-come to him and not yet assimilated, but he did not look for them as the man was looking, did not consciously gather evidence in the same mingled state of astonishment and expectation. “Who’s that, Muninn?” said August, watching the man bend over some of the rocks, tracing lichen with his fingers, the lichen that grew on some surfaces and not on others, the lichen that August had not noticed until the other had done it for him. Beside them, Huginn made a rude sound. “Oh, you think everything is plodding,” said Muninn. “Not everyone is as quick as you.” And Huginn, impatient at the chastisement, made another rude sound and hopped away, hopped towards Charles as he bent over lichen, poking and scraping, and waited next to his knee with more patience than he had ever extended to August. “I was born in the wrong month for tortoises, wasn’t I?” said August, resigned and mournful at once. August smiled and bit his lip–he thought it might have been rude to laugh. “I wonder if we’re surprised by the same thing,” he said, he who had been surprised by size and smallness, he who watched Charles also focus on a smallness, and not the same. For Charles had risen from his crouch and was searching for more lichen, was ignoring the view in favour of the ground, of the broken rocks, and while August did not grudge the interest neither did he understand it. Perhaps Charles had had more experience with mountains than he had, and they were no longer exciting to him. “If you say so,” said August, who didn’t understand one bit. “Is that what he’s looking at?” said August, and then he could see it himself, because the rock on which he sat was dead rock, hard and empty, and the rock beside his feet was traced with life, with the lacy patterns of lichen. “He can get all that from lichen?” said August. “He’s going to learn a lot,” said August. “Me, too,” said August, almost absently, as he watched Charles, as he watched the lichen at his feet, the tiny pieces of life that could so easily be broken off and crushed. Tune in tomorrow for the next chapter, wherein August is taken back in time to see Pierre Janssen discover helium! August peered around the bird. “She looks as sick as I feel,” he said. Jane was sitting beside them, her blonde hair pulled back into a pony-tail, and her face was wet with sweat. She was indeed sitting quietly next to her companion, August noted with some disgust, and neither of them were over-concerned with insects. But there was a vagueness in her eyes that he recognised well enough–he was used to feeling dizzy and weak and a little strange himself, used to the haze of dim reality, the way the world looked slant through sickness and almost familiar. She had been lying down when Huginn and Muninn brought him into the little clearing, a high point streaked about with ravines that August had seen from above, and wooded. Huginn had landed right down by her face, his iron wings working to make a breeze over her and she had shifted then, raising herself up to sitting and wiping the sweat from her eyes. “Why did she come all the way up here if she isn’t feeling well?” said August, who had seen the climb from his perch on Muninn’s back, who had been grateful that it was not his to make. “A shocking concept,” said Muninn, and her voice was very, very dry. August suspected that she was making fun of him, but the thought didn’t bother him as it would have in the week gone past, where he had taken all attempts at humour as mockery, and cruel. He stuck his tongue out at her, and then again at Huginn for good measure, but the other bird ignored him. He was looking at the open ground ahead of them, a clearing in the trees and the woodlands, and Jane was looking with him, in the same direction and waiting. “What are we going to see?” said August, and Muninn sighed. “Who?” said August, but before he could ask anything more there was the steady sound of footprints, of a large animal approaching, and out of the trees, only a few metres away, appeared a chimpanzee. His fur was shining and very black, as black as raven wings, and he had a white beard. 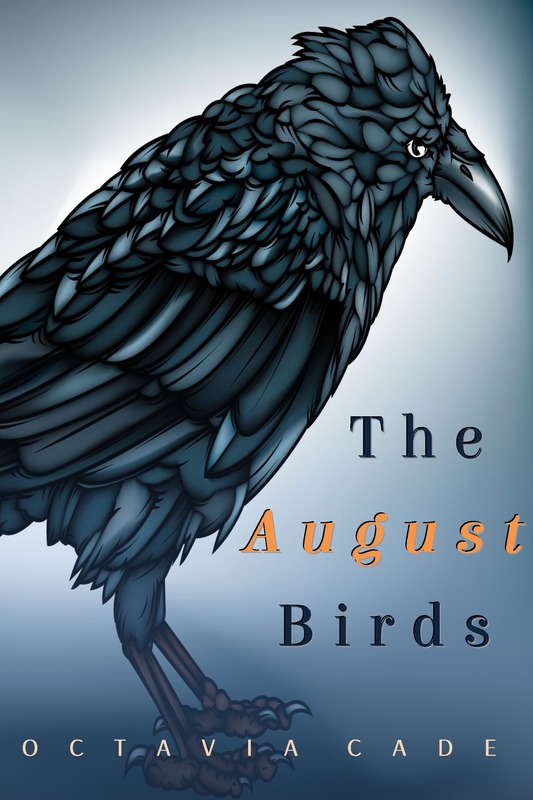 August and Jane and the ravens were close enough to see his expression, and it was a mirror of their own, of surprise at strange creatures and chance meetings. The chimp stilled, staring, turned his head to one side and then to the other, craning as August craned for a better view, for curiosity and connection. “Will he come any closer, do you think?” said August, holding out his hand and forgetting, for the moment, that the chimp could not see him, that it could only see Jane and her companion. “We wouldn’t hurt him,” said August. And the chimp was moving then, as if in illustration of a caution other than their own, moving out of his path and into the undergrowth. August sighed, disappointed, but the sound of the chimp moving through the vegetation did not fade away and August turned about in concert with Jane and the ravens, as the other animal made his way around and below them, rejoining the path he would have taken had the clearing been empty and he’d been able to walk through without hindrance. “I can still hear him,” said August, pushing himself up on bony knees so that he could see better. “I wish I could see him.” He tried to catch Muninn’s eye, but the bird was very deliberately staring at the ground so that he could get no clue from her, and Huginn was standing beside Jane and crowing to himself as if he were laughing. “Look!” cried Jane. “There he is, up there!” And August saw her expression alight with more than fever, followed her arm as she pointed and saw the chimpanzee again, and above them. He had climbed a tree to look down upon them, climbed for a better look, for curiosity and cleverness. “He’s spying on us!” said August, delighted. “You are an ape, are you not?” said Muninn. “It must have been so strange,” said August, who had lived a double life himself, who had gone from his own kind and his own home and into the homes of others, who had seen discovery and war and failure in those others and seen them again in himself. Who watched Jane, the sweat and fever and sickness in her face and the wonder painted over all until the sickness was only secondary. “There were points of familiarity,” said Muninn. “In a different context, but they were there. Tool use, carnivorism, aggression. The ways that families came together, the ways that they came apart.” She paused, and did not look at him. “Sometimes it is not so easy to see in others what we think of as belonging to ourselves,” she said. Tune in tomorrow for the next chapter, wherein August is taken back in time to see Charles Darwin search for evidence of earthquakes in Chile! For the first time in nearly a week August did not wake with anger. Instead, April was with him. They snuggled under the covers together and if it was a tight squeeze she had brought biscuits to compensate, sneaked from the kitchen the lovely ginger biscuits made for August by the lady who lived next door because she knew he liked them. They’d spoil his breakfast, but August didn’t care and sugar was one of April’s primary food groups. “Still,” said August, between mouthfuls of his own, “it’s a nice thought, the ripples. Little bits of me reaching out. It’s like being remembered.” He paused, leaning against her and her body was solid and warm against him. “You’ll remember me, won’t you April?” For more than tantrum, he wanted to add but couldn’t. For more than sickness and selfishness and shrieking at you for things that were never your fault. His mouth still tasted of ginger when the ravens came, when they flew him over oceans and deposited him on the deck of another ship, this time the Ancon, caught this time in lake waters instead of shoals, and in no danger of sinking. “This is the first official trip through the Panama Canal,” Muninn had told him, and August had leaned against the railings as the ship was lifted through locks, as it floated between steep banks of rainforest. “It’s hard to think of it ending soon,” he said. “That the me that stood on this ship and saw the birds and smelled the trees and the water will be gone.” That this would be the last of him, nearly, the ending days of August. “There will be other Augusts,” said Muninn. “Other months, other boys. You are not the last.” Other journeys, other sailings. Other boats laden down with cargo and sent from safe harbour. “Oh, let’s not pretend she’s not cleverer than I am,” said August. He had two weeks left–two weeks and two days and there was no time left for lies. It didn’t even bother him anymore that April was cleverer than he was, that she would survive when he did not. It had bothered him before, bothered him badly, and he had hurt her for it. But now… after exile and extinction, after shoals and snow petrels and reaching out in his sinking he couldn’t feel bad that she would live, that she would take herself out into the world and make it better thereby. “Then let us not pretend that her abilities take away from yours,” said Muninn. “You are capable of encompassing continuum, August. And if it is something that you need to see as well as think, then I can give you the looking of it. Hold to the railing, now–and don’t let go, no matter what you see.” Or what he didn’t see, as he clutched at the bars as he had clutched at those on the Arapahoe, this time for expectation instead of expulsion. For the bars began to fade–August could still feel them solid in his palms, his fingers curled around them–solid as the deck was solid beneath him, and also disappearing, becoming a faint, wavering stain against the landscape, against the water that was Canal and lake at once and it was as if he were standing in an invisibility more thorough than that he had experienced thus far with ravens. But it wasn’t only the ship that disappeared, for the lake itself began to run backwards, to shrivel into small channels and then into a wooded valley with a river running through, too small to carry the Ancon even though he felt it silent beneath him, still smooth-sailing through another time. “Yes,” said August, for beneath his feet the water was rising up in the valley, pooling and shrinking the land, transforming hills to islands, making the lake wide enough and deep enough for shipping, and the Ancon came back to life underneath him and then faded again and the Canal was full of ships, ships laden down with containers and cargo, easing past them as if the Ancon was a ghost in the water, and absent. Slowly then, the first boat, the boat that would be decommissioned long before August’s death, long before the end of the Canal, came back into focus and August saw as well as felt it under his hands, under his feet and all around him, the railings and the chimney and the flags. “That’s the Canal,” he said. The images around him stopped: the whirling kaleidoscope of engineering and biology and he was as he had been, a small boy on a steamship, part of history but not pinned to it and no longer feeling as if he should be pinning down. “I do see it,” said August, smiling. There was wind in his face and the Canal smelled of water and wood and oil all together. Tune in tomorrow for the next chapter, wherein August is taken back in time to see Jane Goodall meet a chimpanzee! “So what?” said August. “I don’t care.” But when he heard the front door slam and looked down through his window at April running out of the house, her school bag bouncing on her back and her head down as if she were trying not to cry, not to be seen crying, he did care. Not enough to open the window, not enough to call after her, but almost. His fingers twitched on the latch, but they didn’t open it and August tried to squash down the feelings of guilt as best he could. “I don’t care,” he said again. He was the one who was dying, not her. It wasn’t fair that she should get to go on and be happy, even if she got to go on and be sad first. It wasn’t as if she were going to lose everything she loved, like Lina. It wasn’t the same, it wasn’t. “I guess it’s up to you to give me some better ones, then,” said August, and he knew how he sounded but it was as if the nasty comments were coming from a mouth other than his own and he was just an observer, watching from the outside as someone who looked like him and sounded like him did their very best to make others as unhappy as he was. He kept his head turned away so that he didn’t have to see Muninn’s soundless, disappointed sigh, so that he didn’t have to see the dislike written plainer than ever in Huginn’s iron eyes. Yet when Muninn extended her wing into the corner of his vision, he did not stop himself from reaching out to take it. The first public demonstration of wireless radio transmission was sent between the museum and the old Clarendon Laboratory. Had August been healthy he could have covered the distance between them in less than two minutes. “It’s not far at all,” he said. “It is far enough for Oliver,” said Muninn, and nudged him closer to conversations and to mechanism. “…might reach as far as half a mile,” Oliver said. Beside them, Huginn pecked at the equipment used to transmit the message, sent in Morse code, in dots and dashes, and his beak beat out a staccato rhythm of its own. August knew Morse code, but Huginn was transmitting too fast to be caught, although he thought that Muninn understood. It made him feel jealous again, and he was tired of feeling jealous but unable somehow to stop himself. Muninn was by his side, her stiff black feathers brushing against him, but she felt farther away than she had ever been, and closer to Huginn than she was to him. “He did not do better,” said Muninn. “This was the end of it. He had other interests, and it was left to others, to men like Marconi, to bridge the greater distances, to make a better communication and a longer one. “He was stupid,” grumbled August. August would have talked back then, been as cutting and petty as he knew how, but if Muninn was still holding onto patience then Huginn was not, and he pecked at August’s leg: one hard snap with his black iron beak and that snap said Be silent. And so August, rubbing at the bruise, was silent and thought instead of what he could not say, of the liberties he could have taken and the apologies that he did not know how to make. The door to his room was open, and August lay in his bed, lay in the dark while a small strip of light from the hall illuminated the edge of his bedroom door, and he was thinking still. He could hear voices speaking dimly in other rooms, his Mum and Dad talking in the living room, the sound of the television. He knew that they were disappointed in him, and he knew as well that they were trying very hard not to show it. Mum had smiled at him over dinner, chatted with him as if everything were normal, but she had a range of smiles that pretended they weren’t sad and he knew them all. It was lonely in his bed. The birds were gone, and his parents sounded far away. This was the time of night he would usually have talked to April, past bedtime and both of them pretending to be asleep when their parents came to check. There had been walkie-talkies once, but August had been sick over his and it had never worked well again. Instead, April had taught him Morse Code and knocked on the shared wall between their beds, knocked with knock-knock jokes to make him laugh, and if the knocks and the muffled giggles had filtered downstairs to the living room then their parents had pretended not to notice and let their children have their secrets together. August turned in his bed, and laid his palm flat against the wall. He hadn’t tapped upon the wall for a long time now–it had begun to hurt his knuckles more and more, as he got thinner and thinner and the flesh wore away from his bones, and then he had been too hurt and too angry to knock. The wall felt silent under his hand: flat and smooth, with no vibrations, and the stillness and the silence was that of broken thoughts and missed chances, and before August could think worse of it, before he could talk himself out of it he curled his little fingers into a fist and beat them against the wall. -.- -. — -.-. -.- / -.- -. — -.-. -.- he rapped. Knock, knock. There was no answer, though August waited with his palm pressed against the wall, waited with his breath held tight until he couldn’t hold it anymore, until his bones ached with stillness and his stomach ached for another reason altogether. She always answered him. April had always answered, and she might have been asleep but she might have been angry with him, angry back and not answering, tired of his meanness and with her pillow over her ears so she couldn’t hear him calling for her because the distance between them had become too great to be breached and he had lost his chance to breach it. -.- -. — -.-. -.- / -.- -. — -.-. -.- he rapped again, and his knuckles stung as much as his eyes. Knock, knock. And there was no answer still, and silence, and August left his palm against the wall until he had to take it away to wipe at his face, because he wasn’t crying, he wasn’t, and there was no answer. And then, and then, there was a small noise echoing through the wall, right beside his head and repeated in familiar patterns, and he was laughing instead of crying, and felt better for it than he had in days. Tune in tomorrow for the next chapter, wherein August is taken back in time to see the first boat trip through the Panama Canal!